Thank you, to all Gentle Readers who have responded to the first post, the initial thoughts and questions I proffered, on Spiritual Warfare. Reading prayerfully through all the contributions, I see a couple more steps ahead. It is my hope to cast some light on significant pieces of value to ALL Christians, particularly in areas where we have little contention over interpretations or techniques, and see how far we can get in practical application without generating any discord. But none of that is necessary, or… in THIS moment… edifying. THIS, this Truth, is the foundational, fundamental grounding of our entire Christian lives, made possible through the Birth, Death, and Rising of the Anointed Jesus. Here is the taproot of our life, our abundant life. Here is the connection to the Lover, the Beloved, through this Spirit of Love. And here, in this present context, is our capacity to serve our God of Light and minister to others in need, even in a world populated in part by creatures of shadow and servants of darkness. Are you indwelt of the Holy Spirit? Have you and Jesus embraced one another and entered into the state of Him in you, you in Him, together in the Father? If so… then… How Much Holy Spirit dwells within you? A little, a fair amount, some, a lot, a whole lot? 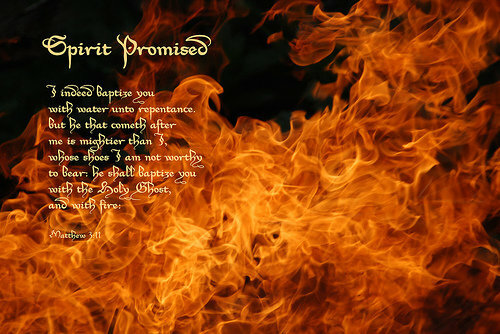 Have you been allocated a quota of “Holy Spirit” for your own life? Like some have more than you, or less than you? Ask yourself, in that you are in Him, and He in you, and together ye are in the Father, what are the implications of that? What authority do you bear? What power dwells within you, your voice, your hands, your fingertips? Do you have just “some”? Do you have just “a little”? Do you have just “enough”? A friend preached a short time ago, using the Gospel of John’s text on the Wedding Feast at Cana. I started this post yesterday, but could not finish it… I knew I needed to wait a bit. Today, I heard this sermon and I knew immediately, that this 32-minute sermon needs to be part of this post. I strongly encourage you to listen and follow this link… (Be aware it is a “Senior Sunday” sermon, but bears only a little bit on “seniors” per se.) The main idea of this entire message revolves around “sufficiency” or “adequacy” of Jesus’ provision. May all these words bless you. Please feel free to respond, reflect, comment, disagree, or engage in this dialogue in whatever manner suits! Blessings and grace to thee! Finally had the chance to listen and ponder. Another wonderful half an hour of “God through my ears” – thank you! At first I could not see the link between “abundance” and spiritual warfare. At second glance, I have my own thoughts – but have no idea what is percolating inside your head and heart. “Abundance of life” – the one thing that gets better as it ages/grows. Everything material goes the other way. If our Lord showers us with more than we need, all we are to do is “to allow”. So where does “the Evil One” fit with that abundance and showering? So could the same be true for the devil, Lucifer, satan? The invitation remains open as for us to be showered in live and life. And (as seems to be the case) that invitation is rejected – the “rules” remain. Each is sacred. The Evil One can make a salespitch, the evil one can entice, the evil one can tempt – but until I and we “accept” and embrace evil – we remain sacred. And maybe acceptance comes in many forms: I would say I have rejected a number of things I held dear pre “yes Lord – I want you”. Does the rejection go hand in hand with acceptance of something else? In my case – yes it does. In rejecting something I am accepting something else and vice versa. So when tempted by evil, if I “reject” my connection with my Lord, am I not tacitly accepting the invitation of evil. And once I accept – then I remain sacred – but compliant (even by default). So how does the salespitch go? With great fear and terror in my case. With a terror so great it squeezes logic, breath, rational thought and – quite easily – my “take me lord” connection in that moment. And if that is a “rejection” of my Lord – is that an acceptance of evil? I remain sacred – and opening the door to something I want so much to keep out. On my own – I will open the door. Together – indwelt and as one – there is no door to open. There is no fear overwhelming. There is an abundance. But I have to grasp, take, keep hold. You never fail to take me new places, even from “my own” (so to speak) words. My desire, in attaching that message, was quite simply to address the issue of “quantity” with regard to “grace”. As we move forward in any consideration of spiritual warfare, our thinking will at times get “quantitative”… what is greater/lesser… who is bigger/smaller… who/what is stronger/weaker? We won’t have units to measure with, but the mind certainly considers comparisons. To enter into dialogue on anything of “How?” in spiritual warfare, without the firmest possible grasp on exactly what “Indwelt” means, in its most fundamental terms… is to invite (at best) confusion, (at worst) disaster. What seems to be emerging in this dialogue will be a decent, orderly, calm step-by-step consideration of our own Christian co-existence in a world populated by others both of light and of darkness… without fear, compromise, or condemnation of others. I hope we move towards a Kingdom life of mutual ministry, edification, encouragement, and love. Nonetheless, your reflections are wondrous. Thank you for sharing those! I wanted to say, as I pondered everything in part 1 and everything I have shared. It reminds me of Job. Spiritual warfare/sifting – what it is. It is completely and totally overwhelming. You are attacked from every direction in your life. Just like Job it is mental, spiritual, and physical. Here is an example- Its like wreaking your car and being badly injured, then coming home to find your house went up in flames, and your dog die. Then you turn around and find your auto and homeowner insurance policy has lapsed. Now your broke, beaten, oppressed, and depressed. No car to get to work and no house to come home to. You turn to others for help, but they can only do so much. They have there own lives and problems to deal with. Maybe they give you a ride to work a couple times, and help you dig out anything you can salvage from the fire. But the impact to your life is so overwhelming it is too much for anybody to “fix.” All of sudden you have “issues” and people start avoiding you, judging you, and try to help by pointing out all your fault and failures. It doesn’t matter how strong you, because you are being tried and tested. The whole process is to bring into complete submission, humility, and to acknowledge by faith that only person that can help you is God. Now are you going to trust Him no matter how things look on the outside? This is fighting the good fight of faith. This if trusting Him totally and complete. It the time when you see if your faith is going to hold water. Like the Ark as the water rises, so must you faith/trust. LM, I am exited. I feel like I am finally starting to get somewhere. I wanted to ask you if you would do a post on our authority in Christ when it come to these things. Me too!! Thank you Denine! “How much Holy Spirit dwells within you?” How much water is in a faucet? I used to think of believers as conduits for the Holy Spirit, like water lines and faucets. These days I think we’re more like sponges, squeezed out as needed and refilled.